The City of Hot Springs is combining Complete Street planning with a larger watershed development approach in its downtown Thermal Basin District. The Malvern Avenue Plan will constitute the first phase of a greater Low Impact Development Hot Springs Creek watershed project to alleviate downtown flooding. Street retrofits are planned in tandem with daylighting of Hot Springs Creek and improvements to its riparian corridor. Retrofits triangulate walkability among the convention center, downtown, and train depot transit center. Malvern Avenue was once a lively African-American neighborhood with a business and entertainment district equal in vitality to Central Avenue’s famed Bathhouse Row. New corridor spaces include an Outdoor Museum memorializing famous Chitlin’ Circuit blues and jazz performers like Count Basie and Ella Fitzgerald who played on Malvern during the era of racial segregation. 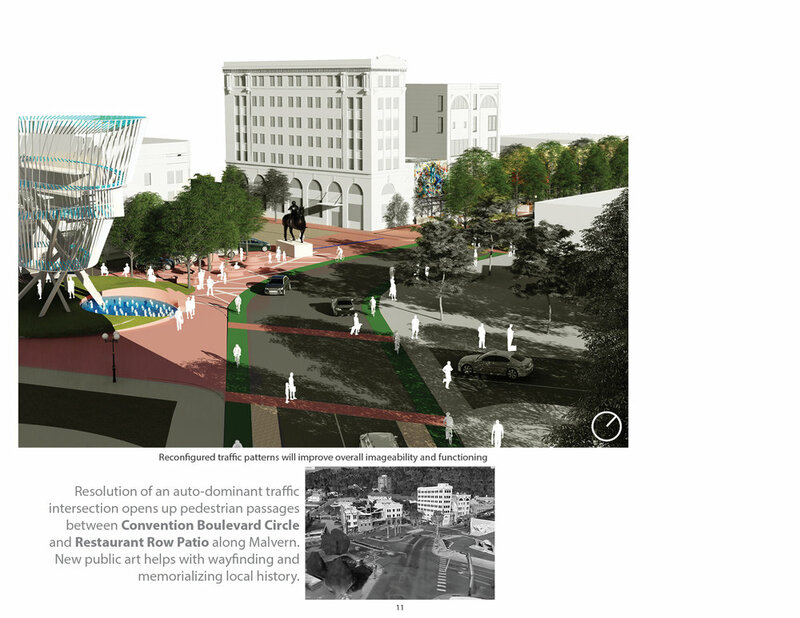 Hence, an innovative and transferable vocabulary of niche street cross-sections—restaurant row patio, outdoor museum, boulevard circle, promenade, depot water garden, hotel plaza, and riparian loop—recodes the district to solve for urban-ecology challenges in water management, mobility, and aesthetics.